So it’s a head to head battle between the Pukeko; a multinational entity which shills for one of the country’s worst polluters, and the KÄkÄriki; a bird whose very name means green. 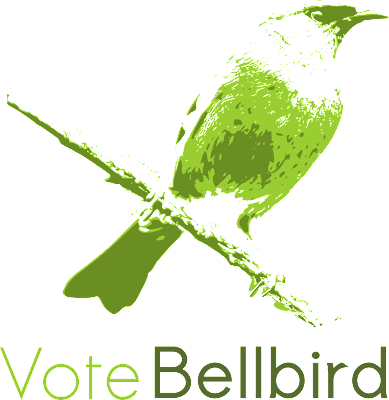 Obviously, the bellbrid campaign still values and wants your vote, but if you can’t make the korimako your bird of year, then we urge you think green! As the campaign manager for the most excellent little blue penguin, I’ve watched in despair as the long-legged pukeko raced through the polls, leaving my little blues waddling along sedately in the dust the ‘kekos left behind. The bellbird is well worthy. But how about the year that the grey warbler took top bird? I think the grey warbler’s victory was on the back on an endorsement from Graeme HIll who is a big fan. But a very impressive effort none the less! Pukeko!! OMG, that just inspired me to vote. For something else. If people like their big blue birdies, maybe they should vote for the Takahe, which really needs some exposure. Only 230 odd adults left, and pretty special, and yet crazily, many New Zealanders have never heard of them! Perhaps this isn’t the week to be dredging up anti-immigrant sentiment, but whereas the pukeko is a recent arrival and hardly different than this species across the rest of the world, the takahe is a uniquely New Zealand version of the swamp hen. Modern takahe descend from a pukeko-like ancestor that invaded the South Island millions of years ago, and, isolated here got pleasently plump and gave up on flying. It seems the (now extinct) North Island takahe was the result of another such invasion while the pukeko is the latest wave. An of course, the takahe has the Lazurus factor going for it!